The School of Communication offers the following scholarships for current students. Please stop by the School of Communication office on the 10th floor of Thayer Hall for more information, application materials and deadlines for each scholarship. The Kathleen Smith Memorial Graduate Fellowship Scholarship, a minimum of $1,500 annually, is awarded to an outstanding graduate student in the School of Communication who is entering the second semester of work on their master's thesis or a research project. The award is competitive and based on merit. Professor Smith was instrumental in initiating the master's program in journalism and mass communication. This scholarship, a minimum of $1,000 annually, is awarded to an outstanding undergraduate student in the School of Communication. Major factors include grades, need and essay. Students must be a junior or senior and have a 3.0 grade point average. Award winners must maintain their average throughout the one-year award period. This scholarship, a minimum of $1,000 annually, is presented to honor the memory of Margy Snyder, a news producer for KDKA-TV and Point Park journalism major. To be eligible, students must be full-time broadcast majors who will be a junior or senior and has a minimum 3.0 GPA. Awardees must maintain that grade point average. This scholarship, a minimum of $1,000 annually, honors the memory of Myron Cope, legendary and beloved Pittsburgh sports journalist and broadcaster. His writing and broadcasting talents made him an icon to sports fans and citizens in Pittsburgh and across the United States. To be eligible, students must be a junior or senior with a 3.0 QPA and have an interest in sports journalism and broadcasting. Experience in student media and/or membership in the school's professional clubs and organizations is a plus. This scholarship, a minimum of $1,000 annually, and internship is awarded to a junior or senior majoring in journalism or photojournalism who is interested in a newspaper career. A faculty committee will review all entries and select three to five finalists, and final selection will be made by Post-Gazette editors. The internship will be scheduled for the summer, fall or spring based on the Post-Gazette's needs. 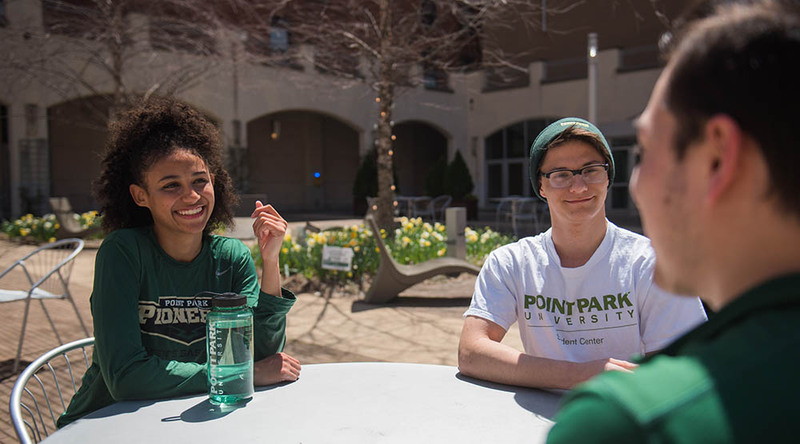 To be eligible, students must be a junior or senior with a 3.0 QPA, must have successfully completed Practicum (or registered to complete it in the next academic year) and have writing, reporting and photography experience through work in Point Park's student media or an internship. This scholarship, a minimum of $1,000 annually, honors former faculty member William Schmid. This scholarship is awarded to a full-time sophomore, junior or senior with a minimum 3.0 GPA. This scholarship, a minimum of $1,000 annually, honors the memory of longtime faculty member and chair of the Department of Journalism and Mass Communication Vincent LaBarbera. Applicants must have completed at least one semester of undergraduate work in journalism or mass communication and have earned a cumulative QPA of 3.3 or higher. This scholarship, a minimum of $800 annually, is awarded to an outstanding School of Communication student in any major who is entering their senior year in the fall semester.